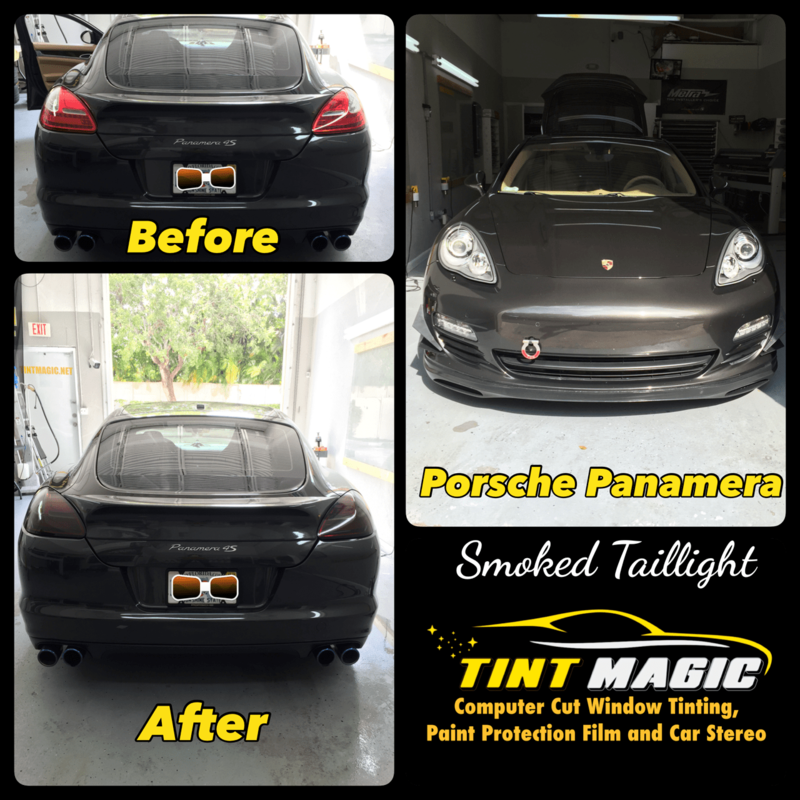 Porsche Panamera Smoked Tail Lights at Tint Magic Window Tint Coral Springs. We applied over tail lights Oracal vinyl to get the effect of smoked. Call us for the best quality and service! (954)840-7883. The Porsche Panamera is as it looks—a surprising combination of large luxury sedan and high-performance sports car. It offers a lot to love, to a wide range of potential buyers, thanks to its large and truly usable back seat, upscale interior, and brilliant dynamics, plus a range of powertrains that permit frugal plug-in hybrid operation or near-supercar performance. Yet the Panamera isn’t for everyone who can afford it; the look is polarizing—especially at the rear—and it spirals easily out of pricing control if you don’t lay a judicious hand on the options order sheet. If you can handle the price and if you love the look, the Panamera’s performance, its wide range of available powertrains, and its available custom touches make it a keen alternative to the likes of a BMW 6-Series Gran Coupe or a Mercedes-Benz CLS—or even an S-Class. Last year, the Panamera S E Hybrid was added, bringing new and high-tech gas-saving features to the Panamera line. For the new model year, the Panamera hasn’t been changed in any significant way—only a few cosmetic touches have been altered, and only a few features changed. The Panamera’s styling is an acquired taste. Last year, a complete though mild redesign gave a more streamlined, swept-back look thanks to revised front and rear end treatments, a shallower windshield angle, and, on Executive models, longer rear doors. The long roofline and the arch near the rear end are supposed to call up subconscious associations with the 911, but instead it looks awkward. From most other angles, the overall effect is appealing, if somewhat super-sized for a Porsche. The cabin’s sportscar touches are welcome; there’s a button or a knob for almost every function, so there’s no muddling around with touchscreen controls. In the back, the Panamera’s an executive limo, with plenty of space and features. From the base and Panamera 4 models, now sporting 310 horsepower and 295 pound-feet of torque from a 3.6-liter normally aspirated V-6 engine, to the Panamera Turbo at 520 horsepower from a 4.8-liter twin-turbo V-8 engine, to the all-new Panamera S E-Hybrid’s 416 horsepower from a 95-horsepower electric motor and 3.0-liter supercharged V-6 combo, there’s plenty of pep at any point in the range, with room to upgrade for those seeking more get-up-and-go.